The modern world is filled with people who are worried about their health. New information about how fat and cholesterol affect the heart and the rest of the body is enough to make just about anyone start to second guess the food they are putting into their body. This is why more cafeterias have started to give serious consideration to the health of the foods that are being offered on the menu. Offering healthy menu items is not only a responsible way to look after the health of diners, but it is a great way to increase profits. After all, by giving people more healthy choices to eat, they will not bypass your cafeteria in favor of outside restaurants that offer the healthy choices they are looking for. Salads are the first thing people go to when they are looking for something healthy to eat. The name itself has become synonymous with healthy eating. Having a salad option is just plain good for business. You can add a salad option to the cafeteria through either a salad bar option or via pre-made salads. Salad bars can be expensive to operate unless you have plenty of people eating in your cafeteria who eat a lot of salads. The items that go in the salad bar can usually be used more than once as long as they have been maintained at or below 40 degrees. Just make sure that tongs are being used at all times so that the food will not become tainted from one use to the next. 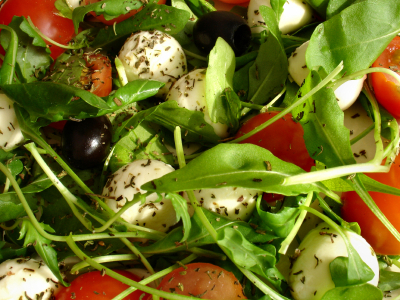 If having a salad bar is not economically feasible, you can still offer a salad option with pre-made salads. Make a few different kinds for variety including a house salad, chef salad, Cobb salad, southwestern salad, summer salad and more. There are hundreds of salad options to choose from, so keep trying new options to keep your customers interested. The fresher you can make these salads, the better. Offer prepackaged salad dressing, convenient take out containers, and plastic forks in case people want to take their salad to go. Make sure that when you offer something that is healthy -- you highlight it. One popular way to show people that something is healthy is to put a red heart on the menu choice. Offer things like baked or grilled chicken instead of fried. Offer steamed vegetables rather than veggies cooked with a butter sauce. These will show people that they can trust you to offer menu items that they can actually eat. In order to offer even more options, you can look into popular dishes and alter the recipe so that they are lower in fat and cholesterol. A few tricks can help you accomplish this. Use replacements such as plain yogurt instead of sour cream and in some cases, instead of mayonnaise. You can also opt to use low-fat cheese in some recipes rather than the traditional fatty cheeses. The last thing that people want when they go to the cafeteria for healthy food is to find that there is only a choice between soda and water. Offer some healthy alternatives in your drink selections. Rather than just offering sweet or unsweetened tea, offer iced green tea and other iced tea flavors. Use beverage dispensers to dispense light lemonade or fruit juices. Consider that many diners do not want to feel like a hypocrite by drinking sugary sodas while eating a salad. Complete their meal by offering drinks that suit the rest of what they have on their plate.